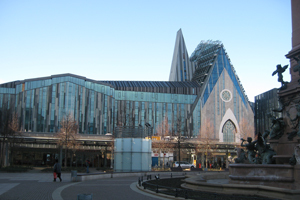 Leipzig and its university had everything Novell wanted: a central location, modern facilities, culture and history and a variety of restaurants. Pre-event planning Bracknell-based software company Novell holds an annual technical conference for its Technology Transfer Partners (TTP) group, made up of people who use Novell products within the central computing facilities of universities, colleges and schools across the UK and mainland Europe. The company always looks for a venue that is easy to access, because delegates travel from various countries to attend. As Novell has a large concentration of academic customers in Germany, it decided to host the event there, with Leipzig and Dresden the two main contenders. University of Leipzig was chosen, and prior to the event, Dr Peter Atkins, TTP coordinator at Novell, visited the venue and liaised with the tourist office to plan activities and draw up joining instructions. Delegates were kept up to date with conference information via a dedicated website for members of the TTP group. Objectives The sessions are intended to bring the delegates up to date with product developments and future plans for Novell products in general, as well as providing networking opportunities. Challenges The venue needed to be easily accessible, with a variety of accommodation options nearby. The conference sessions were due to be held in English but some of the delegates attending expressed a preference for some presentations to be conducted in German. Solution "Leipzig won due to the facilities we were able to use at the university, which is centrally located within the city," said Atkins. "It is also surrounded by suitable hotels and evening entertainment locations and we felt that it had better transport connections." Novell ensured it had speakers who were able to present in German and it added an extra track to the conference to accommodate this. During the five-day event, senior Novell staff, product managers, academic institutions and partner organisations gave presentations and sessions of a highly technical nature. A welcome reception was held on the first evening at the historical Bayerischer Bahnhof restaurant and delegates also opted to take walking tours of the city with a guide. Group dinners were arranged across the five days at a number of restaurants, including the Ratskeller, in the old part of the city, and the zoo. Client verdict "The restaurants were used to catering for large parties and the dinners were well organised," says Atkins. "I was especially pleased with an Africa-themed dinner held at Leipzig Zoo, which was very professionally done." Post-event analysis Overall, delegates were impressed with Leipzig, as it offered a mix of history and culture with a range of bars and restaurants. Many thought facilities at the university were modern and spacious and Atkins says the event was a success and very well attended.